Make an unforgettable entrance this Halloween with the Frankie Costume! 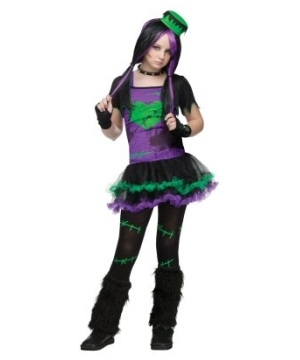 Funkie Frankie Teen Costume includes dress with purple graphic printed top and two-layered tulle dress with green and purple ruffle details, attached black vest with green trim, fingerless glovelettes, black footless tights with green "stitch" graphic prints, mini hat on headband and black furry leg warmers. This fashionable Frankenstein Costume for girls is available in Teen size (0-9). Please note wig and shoes are not included. Review(s) for " Funkie Frankie Teen Costume"